Casey Affleck and Rooney Mara play “C” and “M,” a young married couple living in a quaint country house that might be haunted. We don’t know much more about them, other than C (Affleck) is some kind of composer, that he and M seem to be having relationship trouble, and that the two never, ever smile. A Ghost Story seems to take itself ultra seriously, and Mara and Affleck gloom and glower for all they’re worth, even before a death fractures the narrative. 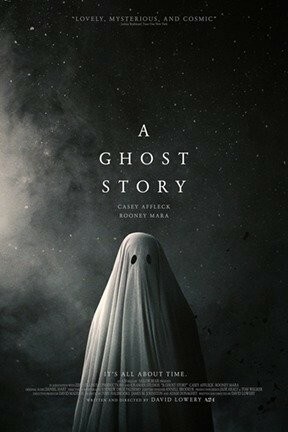 But while A Ghost Story seems to be setting us up for a film that’s going to wallow wallow wallow in beautiful, tragic grief, it eventually goes full existential. It’s hard to say “visual tone poem” without it sounding hopelessly pretentious, but Lowery isn’t afraid of being vulnerable or seeming silly, and A Ghost Story is poetic in the best way—its ideas are little too big to reduce down to simple prose, and its abstraction reflects a grasping towards meaning, not a way to disguise a lack of it.